Manufacturing — at least according to those on the stump — needs to come home to roost, and it needs to stay home. As a candidate platform, this one idea receives resounding applause at Republican and Democratic town halls and rallies across the United States, but just how apt an idea is it? The Meaning of the Word "Apt"
Manufacturing, as it turns out, has been silently coming back onshore for the last few years. According to the Reshoring Initiative, the manufacturing job “bleed” that started during the first heady days of globalization and continued through 2010 has effectively been stanched. Onshoring now breaks even with offshoring and will soon surpass it. So why don’t the candidates seem to know about it? From the fast growth of technology in manufacturing to the reality of steadily rising wages in developing countries, making things “over there” is no longer as cost-effective, time-effective or reliable as it used to be. Manufacturing has shifted, and the American worker stands to gain. More and more American companies are onshoring, and the nation has surpassed China to lead in foreign direct investment (FDI). However, this meaningful shift in American manufacturing is still no guarantee of future success. Over the course of the next decade, the U.S. economy is projected to need 3.5 million manufacturing jobs. Unfortunately, 2 million of these are likely to go unfilled due to a skills and training gap that is only starting to be addressed. And that’s looking ahead at a problem that’s already here. The Manufacturing Institute reports that 82% of manufacturers today suffer from a moderate to severe skills gap, which means that products never make it to market, growth is impeded, and the ability to sustain current business is at risk simply because there are not enough people to do the work. Add to this number the fact that nearly a quarter of workers who are currently employed will reach retirement age in the next few years, and the true talent gap in manufacturing starts to emerge. What our next president needs to understand is that manufacturing isn’t just coming onshore; it’s about to beach itself like a pod of whales. The opportunity to ensure manufacturing’s place in the future of the U.S. economy needs neither courting nor coercion. It needs a well-trained and highly skilled workforce capable of handling the complex and adaptive work that makes up modern-day manufacturing. The masses may love a speech about wresting manufacturing jobs back from overseas, but unless the U.S. workforce can actually do those jobs, they’re likely to languish here before landing elsewhere. Investment in a 21st-century manufacturing workforce is essential. Whether that investment comes, as Jeffrey Rothfeder, former editor-in-chief of International Business Times, has suggested, via tax incentives given to companies that offer real-world apprenticeships or via federally funded retraining programs, is almost beside the point. The fish are here, and more are on the way. Any presidential candidate with solid ideas about keeping them and increasing their number will not only gain an entire industry’s notice but likely its votes as well. 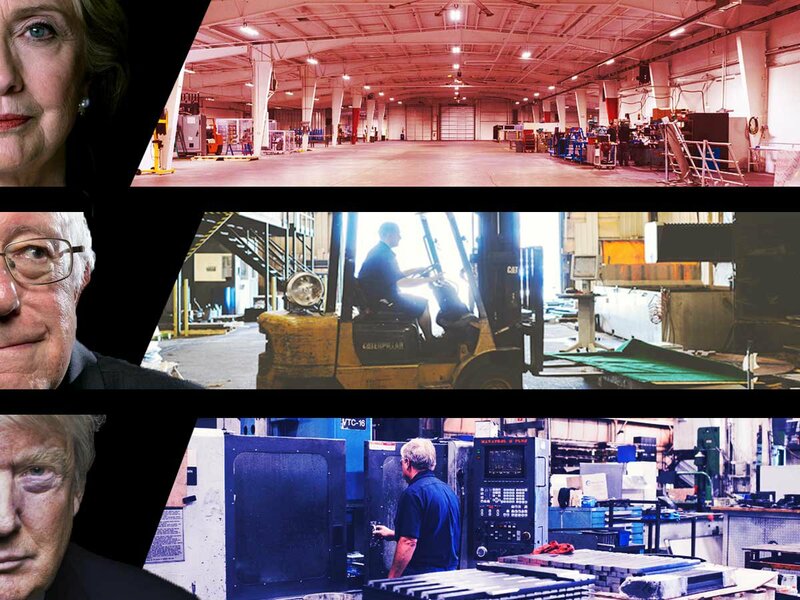 Find out how MakeTime’s revolutionary approach to onshoring allows U.S. parts makers and machinists to save time and make money.